Dallying In The Dirt, Issue #150 --- The great wind from Mother Nature sets our agenda. Last night the ponds froze over. The hose I was topping them up with, is now a solid rubber stick and the rain barrels are going to be very difficult to empty except by pulling out chunks of ice. I was not ready for this much winter this early but then Mother Nature has rarely followed my agenda. The old girl also set my agenda early in the week. Last Sunday night we had a wild wind storm and a bit of rain. I looked in the back yard on Monday morning to see a rather large White Ash tree that used to be growing in my neighbour’s yard, now reclining in a rather horizontal position across a large portion of my back yard. One of those events that calls for somewhat immediate action even while being relieved that it didn’t hit anything of significance. 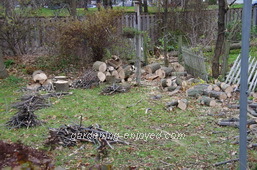 Most of it was in the one large bed that I hadn’t managed to clean up and mulched as yet. Breaking out the old chain saw, I attacked with vigor and my neighbour stacked and moved. Two days later we have a significant pile of nice new firewood for the fireplace, not to mention a slightly sore back. The flower bed has the beginnings of a nice mulch of sawdust. 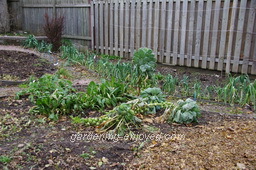 It will be interesting to see how the winter vegetables survived this hard freeze. I know the Brussel’s Sprouts will be fine but the Leeks and Swiss Chard may be a little mushy. The Parsnips will be fine as we often leave them in the garden all winter and eat them as a very early spring vegetable. The Potatoes, the carrots and the Onions are keeping very nicely, along with the Squash, in the cold room and will continue to feed us, long after most of the garden is under some snow. The lawn mower was used for the final time this week as a break from cutting wood. I did give a very short cut to the bit of grass in the front yard but then I took it to the vegetable garden. 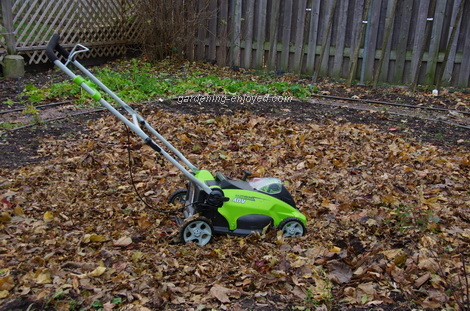 Three large windrows of leaves from the front yard trees, mostly Maple and Ash, were created down the centre of the vegetable patch and then the lawn mower was run over them a few times to reduce them to quite small pieces. This wonderful layer of organic matter is spread evenly over the bare soil and left to decompose over the winter. It will get incorporated into the soil as things get planted in the spring. Many of my neighbours actually throw away this incredible resource instead of improving their gardens with it. Then in the spring they go out and buy organic matter. Now it’s time to move the mower to the back of the garage and move the snowblower forward and make sure it works. Can skiing be far away? Darren Asks? How long do you let your compost heap sit before chucking it on the garden? I've heard 2 or 3 years?? Ken Answers! It gets filled this year and then turned from one bin to the other about now and then used next year as needed. I have to empty the second bin onto the garden in the fall so that it can be used to accept the turnings from the first. That should confuse you completely. Laurence Asks? Is the newspaper column I read, correct, that applying a fall fertilizer at this time of the year will help? My question is, will the fertilizer be taken up by the plants when the grass seems so dormant and the temperature is so cold? Two days ago I had a slight layer of snow on the lawn and I thought that the application of fertilizer now is too late. Am I right or wrong? Ken Answers! Do I really want to wade into this long ongoing discussion? Fall applications of fertilizer are a good thing and the grass plants are building up their roots and crowns for next spring. I'm not sure the N should be slow release as it's going to stop releasing when it freezes. The big question is when. Too early and we generate new top growth that we don't want and too late and the plants are too dormant to make use of it. The first cold days stop the plant growing and starts the storage process. When, is obviously very specific to local conditions. I didn't really answer the question for your lawn, did I? Charlie Comments! My brother uses rock salt to keep weeds out of his asparagus patch. He says the guy he bought his place from always did it, so he does too. No weeds and not much work or time needed to do it. He has lawn surrounding his patch and does not get encroachment from the grass or weeds. The only problem may be salt leaching sideways to other plants that may be salt sensitive. Ken Answers! Yes, rock salt works fine on Asparagus beds. Unfortunately my beds contain Daylilies, Lilies and Peonies along with the Asparagus and their presence precludes my use of the rock salt as a weed preventer.